There I was, sitting in the chapel during my weekly Holy Hour, when a book someone had left on the kneeler caught my attention: Transforming Our Days: Finding God Amid the Noise of Modern Life by Richard R. Gaillardetz. I believe that the true nature of the liturgy does not lie in its being a "sacred act of worship" radically distinct from our ordinary human activities...Indeed the liturgy is focused on "holy things": bread, wine, water, oil. I realized my heart was now burning, indignant that, in a chapter supposedly about the meaning of the Holy Mass, the precious object of my love, my sweet Jesus truly present in the Blessed Sacrament, was being ignored. Instead, the author went on about how we connect the "elements" and "rituals" of "the liturgy" to our everyday lives by some kind of mental exercise. We adore Thee, O Jesus, who has been afflicted in the Garden of Gethsemani and who still in our time art outraged in the Blessed Sacrament by the impious conduct of men. The "impious conduct of men" toward the Blessed Sacrament was a source of anguish for Jesus in the Garden, and if we really believe the doctrine of the Real Presence, this should make sense because the Eucharist is the very person of Jesus Christ. The Eucharistic Presence of our Lord is not an idea - it is as real as the person sitting next to you. Now didn't He say to us, "Come to me all you who labor and are burdened and I will give you rest"? Or did He say, "Come to a liturgy where the focus is on some created "elements"? 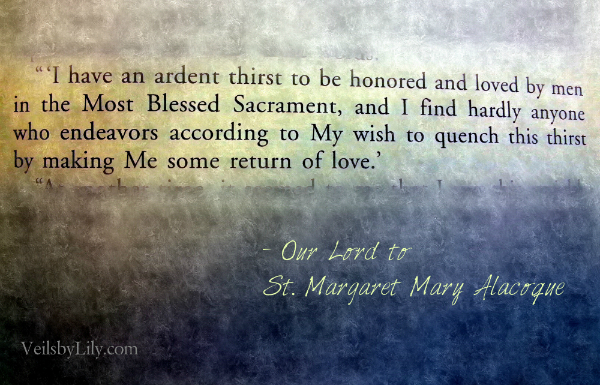 No, He said "Come to me," and He is truly present in the Eucharist! It grieves His Sacred Humanity when we ignore Him or fail to recognize Him in the Eucharist because it is by an intimate relationship with Him that we find the true meaning of our lives. By going to him, recognizing Him, begging forgiveness for our offenses against His eternal goodness, and giving Him the love, honor and adoration He deserves, we give Him a chance to fill us with His love and so sanctify our souls to love others out of love for Him. Give the Lord glory and honor. If the source of our sanctity can only be Jesus and the treasures He has ready for us in His Sacred and Eucharistic Heart, we must give Him all the love, honor and glory He deserves. We must show the utmost reverence for His Person, not out of a sense of duty or a desire to stand out, but because of the ardent love with which He longs for us. Doesn't a husband in love with his wife express it outwardly? And aren't the children edified when a father treats their mother with outward love and tenderness? Why should our relationship with Jesus be any different if the very person of Christ is present before us in the Blessed Sacrament? Sometimes I think that those who criticize us for being "overly pious" or "holier than thou" for veiling before the Blessed Sacrament forget that Jesus is a person and that He is truly present in the Eucharist. Because if Jesus weren't really there, all that reverence would be for nothing more than to "call attention to ourselves." Except... Jesus is there, He is a person, and He does deserve our love, inwardly and outwardly. This reverence is meant to "call attention" to Him. In Ecclesia de Eucharistia, St. John Paul II called the church to rekindle a Eucharistic "amazement." Giving due reverence to the Real Presence of Christ in the Eucharist is the fruit of this amazement, and through it the entire Church can be edified precisely because we testify to the truth of this most sacred Mystery. To testify to the true presence of God in the Blessed Sacrament is to proclaim that the only source of sanctity and meaning for our lives is Jesus Christ, truly present in the Eucharist. 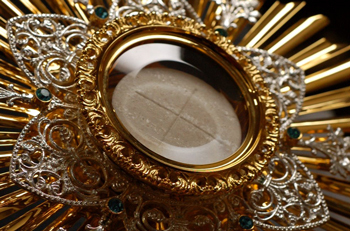 In the Eucharist, given the proper disposition of our hearts, Jesus inflames our hearts with love so that we may take this love and, precisely because of it, strive to do His will in all things: loving as He loves, feeling as He feels, and seeing everything and everyone through the Heart of Jesus. Sisters in Christ: Your veils are but one more sign of this reverence due to God. Let us testify to His true presence in the Eucharist so He may inflame our hearts with His love and so the entire world may know that He is there. 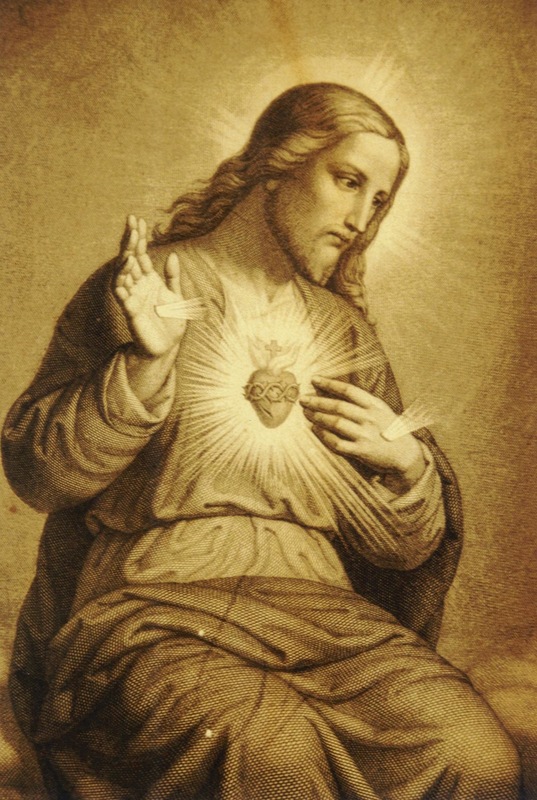 We adore you, O Most Sacred Heart of Jesus. Inflame our hearts with the divine love with which Thine Own is all on fire.